Macaroni and cheese is one of those ultimate comfort foods, but as with many comfort foods, it doesn't have much to say for itself from a nutritional point of view. There's calcium in the cheese, I guess? This version still is far from a health food with lots of cheese, noodles, and bread crumbs. But, it does feature a great mix of fresh, roasted veggies: green peppers, onions, corn, and patty pan squash. These could easily be switched around for anything you have on hand that's good when roasted - zucchini, carrots, asparagus, butternut squash, and green beans come to mind! Because there are a lot of vegetables here, you're best off to roast them on two separate sheets if you have the space in your oven. I did them all on one, and some of them steamed rather than getting all brown and caramelized. 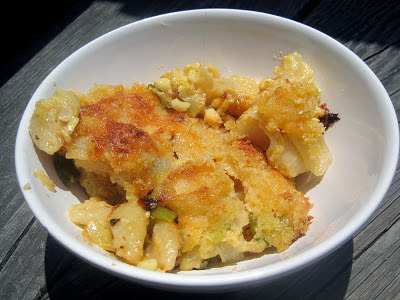 But - they were still totally delicious when stirred into an awesome mac-and-cheese based and then baked. I'll be making this dish throughout the year with whatever vegetables are in season. 1. Preheat the oven to 400 degrees. Spray a 9x13 baking dish with nonstick spray, and line a baking sheet with aluminum foil. 2. In a large bowl, toss together the corn, peppers, onions, and squash. Add enough oil to coat, and season generously with salt and pepper. Spread in an even layer on the baking sheet, and roast for about 30 minutes, until the vegetables are softened and starting to brown. 3. Bring a large pot of water to a boil. Add salt, and cook the pasta for 2 minutes less than called for on the package directions. 4. Make the cheese sauce. Heat the butter in a large non-stick skillet over medium heat. When it sizzles, add the flour and whisk to create a roux (note - if using a non-stick skillet, make sure to use a silicone-coated whisk). When the roux is golden and bubbly, slowly whisk in the milk. Whisk until the mixture slightly thickens. Slowly whisk in 6 ounces of the Havarti, 6 ounces of the cheddar, and all the Parmesan. Whisk in the garlic as well. When the cheese has completely melted, taste, and season with salt and pepper if needed (keep in mind that the veggies and pasta are also seasoned, so don't overdo it). 5. In a large bowl or pot, fold together the pasta, cheese sauce, and roasted vegetables. Scrape into the baking dish. 6. Sprinkle the pasta with the remaining Havarti and cheddar. Then sprinkle with the panko. 7. Bake 30-35 minutes, until the top is golden and the cheese is bubbling. 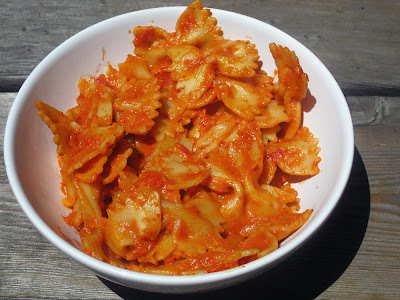 I love vodka sauce - it's one of those comfort foods that just makes me happy whenever I eat it. This recipe was a particular win because I had all the ingredients in my cupboard and didn't have to go grocery shopping! Trader Joe's now makes a shelf stable heavy cream, which is awesome for pulling together a quick dinner - from now on I will definitely be keeping one of these in my pantry at all times. In comparison to the other vodka sauce I make (also delicious! ), this one is heavier on the tomatoes and has less vodka and cream, so overall it feels like a lighter dish. (Of course, it still isn't particularly healthy!) Even so, it makes for an easy and totally delicious dinner that is guaranteed to perk you up. 1. Put on a large pot of salted water to boil. 2. In a large non-stick skillet, melt the butter over medium heat. Add the onions and garlic, and cook until softened and starting to brown, 6-7 minutes. 3. Stir in the tomatoes, tomato paste, chile flakes, vodka, and sugar. Season with 1-1/2 tsp salt. Bring the sauce to a boil over medium heat. Then, reduce to a simmer and let bubble for about 15 minutes, stirring occasionally. 4. With a few minutes to go, cook the pasta in boiling water according to package directions. 5. Off the heat, stir in the cream. Taste, and adjust seasoning. Drain the pasta, and toss with the sauce. I love waffles! They're the perfect low-effort weekend breakfast because you don't have to stand over a skillet like with pancakes (which I also love). The waffle maker my parents got me a couple of years ago definitely gets lots of use in our apartment (thanks Mom and Dad!). I will admit to using waffle mix some of the time when I'm feeling lazy, but it's not really much more work to whip up waffles from scratch, assuming all the ingredients are on hand. I made these waffles because we had buttermilk in the fridge, and the Joy of Cooking definitely did not disappoint. As the recipe header mentioned, these do have quite a lot of butter in them, but this makes them crisp up nicely, and you don't need butter on top. Despite the amount of butter, the waffles taste light because of beating the egg whites separately and folding them into the batter - an extra step, but one that is worth it (well, depending on how awake you are...)! 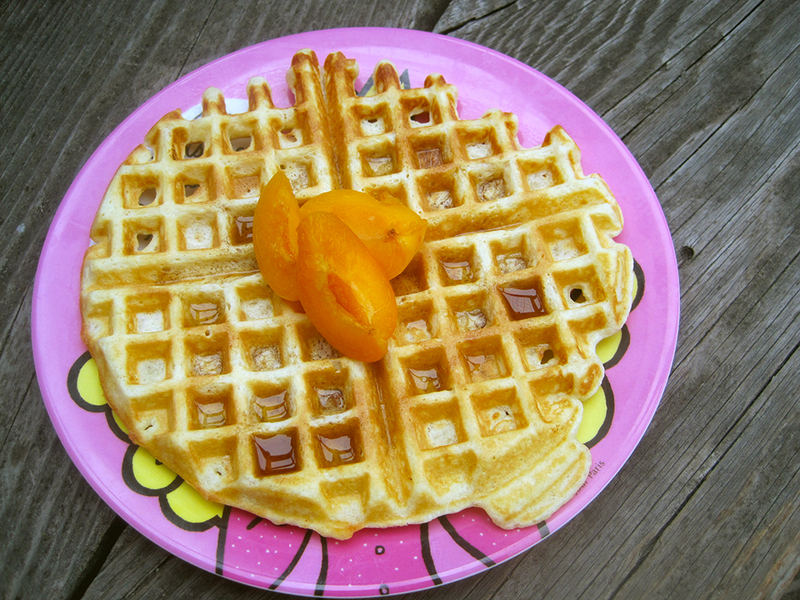 We enjoyed these waffles with syrup and fresh apricots from our CSA, but they have a neutral flavor so they'll be great with your favorite toppings. 1. Whisk together the flour, sugar, baking powder, salt, and baking soda in a medium bowl. Set aside. 2. In a small bowl, beat the egg whites until stiff (but not dry) peaks form. Set aside. 3. In another medium bowl, beat the egg yolks until light (you don't need to clean the beater). Add the buttermilk, and beat to combine. Finally, beat in the butter. 4. Pour the buttermilk mixture into the flour mixture. Gently fold the ingredients together until just combined. Gently fold in the fold in the beaten egg whites. 5. Heat up your waffle maker, and ladle in batter (I was never able to get the amount exactly right, but Joy of Cooking recommends covering the grid surface about 2/3 full). Close, and cook until browned and crispy. Enjoy with your favorite toppings - we used syrup and fresh apricots! Some other waffle recipes I've made and loved: chocolate waffles, crispy lemon waffles, and another recipe for buttermilk waffles - this one is all mixed in one bowl for those less-awake mornings! 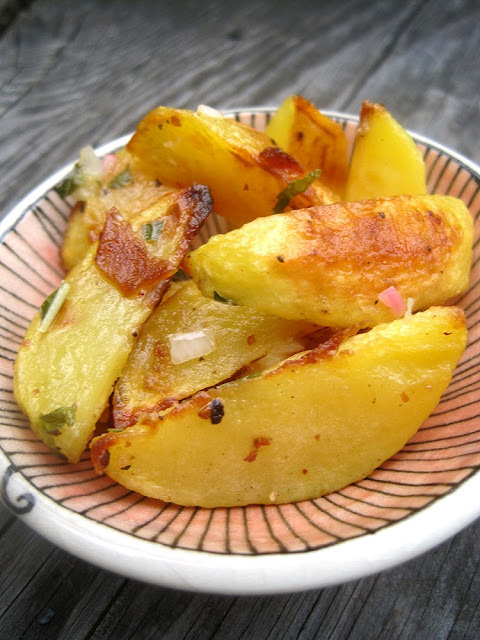 I love roasted potatoes in general, and these particular roasted potatoes are really something special. Although the original recipe is for a potato salad, I found that there just wasn't enough dressing to really call this a salad. Nonetheless, the flavors coating these potatoes are no joke - garlic and Dijon mustard play the starring roles, and both of them are pretty assertive but combine well together. Mint plays a nice back-up role, although really any fresh green herb would be great. If you can find German butterballs, their tender yellow flesh is fantastic - Yukon Golds would be a great substitute if you can't. 1. Line a large, heavy baking sheet with foil and place in the oven. Preheat the oven to 400 degrees (with the baking sheet in the oven). 2. Toss the potatoes with 1 T oil and the garlic until evenly combined. Arrange on the pre-heated baking sheet, and sprinkle with salt and pepper. Bake 20-30 minutes, or until browned and tender, tossing the potatoes after about 10 minutes. 3. Combine 2 tsp olive oil with the vinegar, shallots, Dijon mustard, and mint. Season with salt and pepper, and whisk to combine well. Pour over the potatoes when they come out of the oven, and toss to combine. Serve warm or at room temperature. I have long been a fan of Caroline of The Wright Recipes and her 20-dollar, 20-minute meals column. The meals are always inspiring and look really delicious. So, when she came out with a new book with the same theme, I knew right away that I needed to get it! The first thing I made was Caroline's pasta puttanesca, which was really delicious (and we managed to gobble it up before getting a photo, oops!). 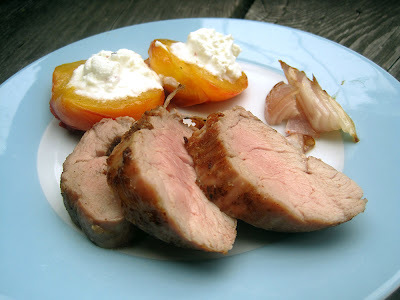 Then, I made an even more delicious recipe for roasted pork tenderloin. I find pork tenderloin to be one of those cuts that's tempting at the store but often a little disappointing in the end. It's cheap and a nice portion size, and I know it will cook up easily and quickly. But, often it can turn out dry and not very flavorful. Well - I've found my new way to cook pork tenderloin, because this recipe results in tasty, moist pork. I think the key here is the combination of a spice rub + browning in a pan before roasting + a honey glaze. Sounds like a lot of steps, but each one is easy and the results are excellent. It would also be really easy to change up by substituting different spices or switching the honey glaze for brown sugar. On the side is a savory version of this roasted peach dessert. Since nectarines tend to be on the tarter side, they pair perfectly with ricotta cheese and roasted pork - simply by subbing salt for the honey and vanilla in the original dish, these move firmly out of dessert territory. Just make sure you choose a good quality whole-milk ricotta here - I like the non-fat type fine in dishes like lasagna, but here it's the star and really needs to shine. Finally, I'd consider the shallots in this dish optional - I added them because I had some on hand that I needed to use up, but I didn't think they were totally necessary. They tasted good, but I think the dish would be just as wonderful without them. 1. Preheat the oven to 425 degrees, and place a baking pan in the oven so it will be hot when you add the meat. 2. Mix together the cardamom, coriander, salt, and pepper in a small bowl. 3. Trim the pork, and pat it dry. Rub it all over with the spice mixture. 4. Heat a large skillet over high heat, and add enough oil to just coat the bottom of the pan. Add the pork, and sear, turning occasionally, until nicely browned (about 8 minutes total). 5. Meanwhile, stir together the honey and water in a small bowl. Place the ricotta cheese in another small bowl and season with salt and pepper - stir to combine. 6. Once the pork is browned, pull the baking dish out of the oven. Add the butter, and tilt the pan a bit to distribute it evenly across the bottom. Add the browned pork. 7. Toss the nectarines and shallots with a little oil, and then place them around the pork, with the nectarines cut-side-down. 8. Place the baking dish in the oven, and roast 5 minutes. 9. While the pork is roasting, add the honey-water mixture to the hot skillet (off the heat) and stir to scrape up any browned bits and to melt the honey. 10. Remove the pan from the oven, and brush half the honey mixture over the pork. Return to the oven, and roast another 5 minutes, until the pork is barely pink in the center. Brush the remaining honey mixture over the pork. 11. Flip the nectarines over, and fill each with a little spoonful of ricotta cheese. Serve with the roasted pork and shallots. My boyfriend recently had to have an emergency root canal, so I knew soup would be on the menu for dinner. Since we had a metric ton of summer squash from our CSA, I looked around for recipes featuring squash and zucchini. This one was the winner because it included potatoes to bulk it up a bit (when you're just eating soup for dinner, zucchini alone probably isn't going to cut it) and because it had a healthy dose of buttermilk, which I just happened to have in the fridge. I wasn't quite sure what to expect, because I think pureed soups can sometimes be a little too much like baby food, but I was pleasantly surprised! 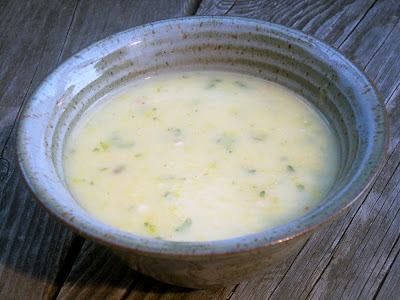 The flavor here is excellent - the buttermilk and fresh mint really make the soup 'pop.' And, the potatoes and dairy do make this soup filling enough to eat as a light meal (maybe add some bread on the side if you can chew!). Best of all, the soup is really easy to prepare, so you'll have dinner on the table quickly. 1. Melt the butter in a soup pot over medium heat. Add the shallots and garlic, along with a few good-sized pinches each of salt and Aleppo pepper flakes. Stir for a few minutes, until the shallots and garlic are softened and starting to brown. 2. Add the squash and potatoes and cook for a few minutes, stirring. 3. Stir in the broth, bring to a boil, cover, and reduce heat to a simmer. Simmer for 15 minutes, or until the potatoes are tender. Stir in the mint. 4. Remove the soup from the heat. Puree the soup with a hand blender. Off the heat, whisk in the buttermilk. Taste and adjust seasoning - I added both more salt and more Aleppo pepper. 5. Serve as-is, or topped with crumbled feta cheese. My partner for this month's Secret Recipe Club is Micha of Cookin' Mimi. 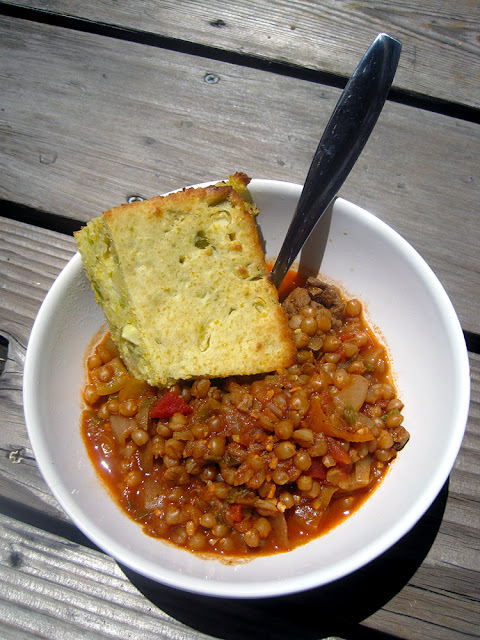 When I saw she had a green chile cornbread recipe on her blog, I knew immediately that was what I wanted to make - I had a can of green chiles in the pantry, two cobs of corn from our CSA, and plans to make wheat berry chili! It was definitely the perfect recipe to add to my dinner menu. This was a delicious cornbread recipe. It's more cake-like than some cornbread recipes, and the added fresh corn kernels make it a little sweet without any added sugar. The bread is really moist, almost custard-like, which I really liked. I also loved the green chilies - they don't make the cornbread spicy; they just add great flavor. Leftovers keep well in the fridge - just make sure to heat them up in a toaster oven before serving, as this bread isn't as good cold. Thanks, Micha, for a fantastic recipe! And thanks also to We Are Not Martha for the wheat berry chili mix that I won in a recent giveaway on her site - it was awesome with the cornbread! 1. Preheat the oven to 400 degrees and spray a 9-inch square pan with oil. 2. In a medium bowl, whisk together the flour, cornmeal, baking powder, and salt. 3. In a small bowl or liquid measuring cup, whisk together the milk, oil, and egg. 4. Husk the corn and cut the kernels off both cobs (this is easiest to do in a high-sided bowl). Add the chiles to the bowl with the corn. 5. Add the liquid ingredients to the dry ingredients and whisk until just combined. Add the corn and chiles, and fold them in with a rubber spatula. Scrape the batter into the pan. 6. Bake 20-25 minutes, or until a tester comes out clean. Has it been hot where you live? We've had a serious heat wave this last week - whew! I can't quite say this is the perfect hot weather recipe because it will require heating up your kitchen a little, but it doesn't involve the oven, so that's always a plus. I also just always think spicy food is great with hot weather - seems weird, but it works! Maybe the hot peppers distract you from the hot air...or maybe they just encourage you to drink lots of ice water. 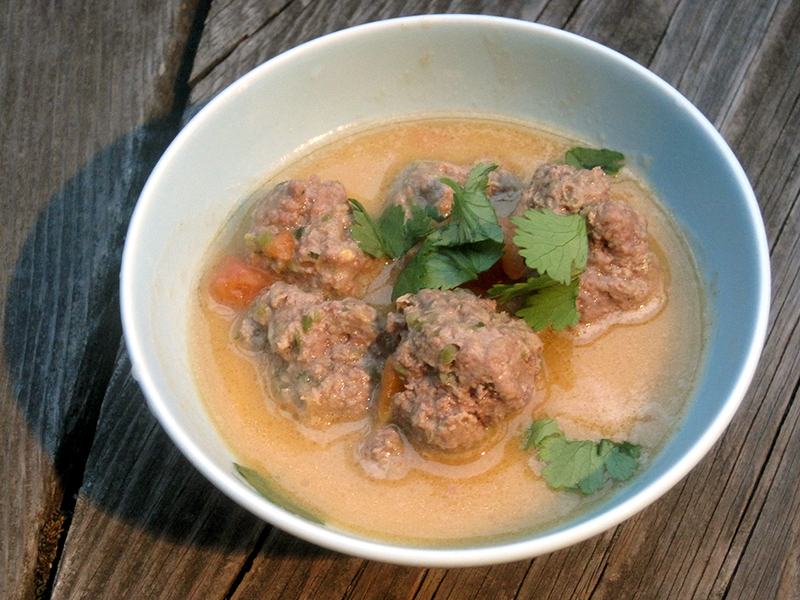 :) Either way, this is an awesome recipe - the curry is super flavorful and I love the unique idea of using meatballs in it...fun and yummy. The ginger and serrano chiles add a ton of flavor - for a less spicy version, you can use jalapenos, which is also good (I've done it both ways). Make sure to serve with lots of rice or naan to soak up the sauce. 1. Make the meatballs. In a large bowl, mix the ground beef, chile, ginger, cilantro and 1 teaspoon salt together using your hands until just combined, being careful not to overmix. Separate into sixteen equal pieces of about 1 ounce each (a kitchen scale is the easiest way to do this). Roll each portion into a smooth ball, and place on a foil-lined baking sheet. Cover and set aside at room temperature while you prepare the sauce. 2. Make the curry. In a large skillet or Dutch oven over medium-high heat, warm the coconut oil until nearly smoking. Add the mustard seeds, covering the pan with a lid to protect yourself from splatters. 3. Once the spattering mostly starts, add the onions, garlic, and ginger. Cook until golden brown. Then add the ground coriander, cumin, and cayenne. Stir and cook for 30 seconds. Add the tomatoes and cook until they soften, about 5 minutes. 4. Add the coconut milk and 1/2 tsp salt, and bring to a boil. Turn down to a simmer and add the meatballs in one layer. (If they don't all fit in one layer, transfer half the sauce to a separate skillet and simmer the meatballs over two burners.) Simmer the curry until the meatballs are cooked through, about 15-20 minutes. 5. To finish, combine everything in the original pot if you've cooked the meat in two batches. Add the cilantro and lime juice. Gently stir to combine, and then taste for seasoning.